The Mandelbrot set. Image Wolfgang Beyer. We know that there are shapes in the plane whose outline is incredibly crinkly. Examples are fractals, like the famous Mandelbrot set. But just how complex can a shape be? As you can see in the picture, it may happen that the intersection consists of more than one connected component. In our example this happens because the outline of curves around and re-enters the disc again at a place away from However, that’s only because we chose to be quite large. By making smaller we can ensure that the intersection of and consists of only one connected component. 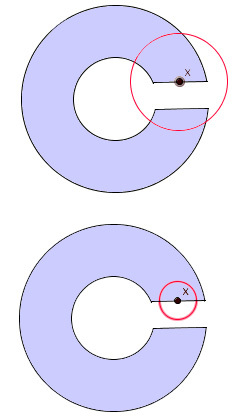 A shape (drawn in the plane) is locally connected at if the intersection of a disc centred at and consists of a single connected component for all discs whose radii are small enough. How can a shape not be locally connected? An example is the comb space. Think of the closed interval (closed means it contains its endpoints). 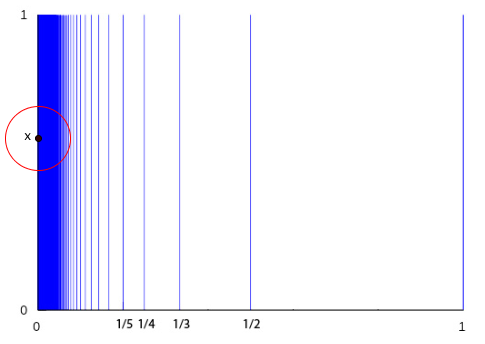 Now at every point of the form where is a natural number, erect a vertical spike of length 1. Also include such a spike at the left-most point of the interval that is, at the point So we have vertical spikes at and so on. Now pick a point somewhere on the left-most vertical spike (but not at the point where that spike meets the horizontal interval) and look at any disc small enough to not contain any piece of the horizontal interval. Since there are infinitely many points of the form arbitrarily close to on the horizontal interval, the disc will contain a piece of each of these infinitely many separated vertical spikes. That’s true no matter how small is, so the comb space is not locally connected at any point on the left-most vertical spike. 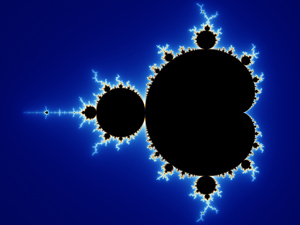 So is our favourite fractal, the Mandelbrot set, locally connected? The answer is that we don't know. Mathematicians believe that it is, and they have been able to show that it is locally connected at many of its points – but they haven't been able to prove that it's locally connected at all of them. The question can be stated as to which rate of change is the faster one. Is the rate of shrinkage of the contour or of the continuation loop (circle) the greatest. If they are related, then the connectivity is zero because the RATE of shrinkage of the fractal (and of the comb too) depend inversely on the size of the previous change which is a logarithmic variation, whilst the rate of change of the continuation loop is a reciprocal one. Then connectivity is zero for both cases. However if these two changes are arbitrary or unrelated, there is no answer.